If you feel like Chicken tonight, try our Organic Chicken breast fillets with skin on. They’re incredibly lean, so they’re perfect diet friendly food. You can keep the skin on as a tasty treat or remove it after cooking to keep your breasts moist. 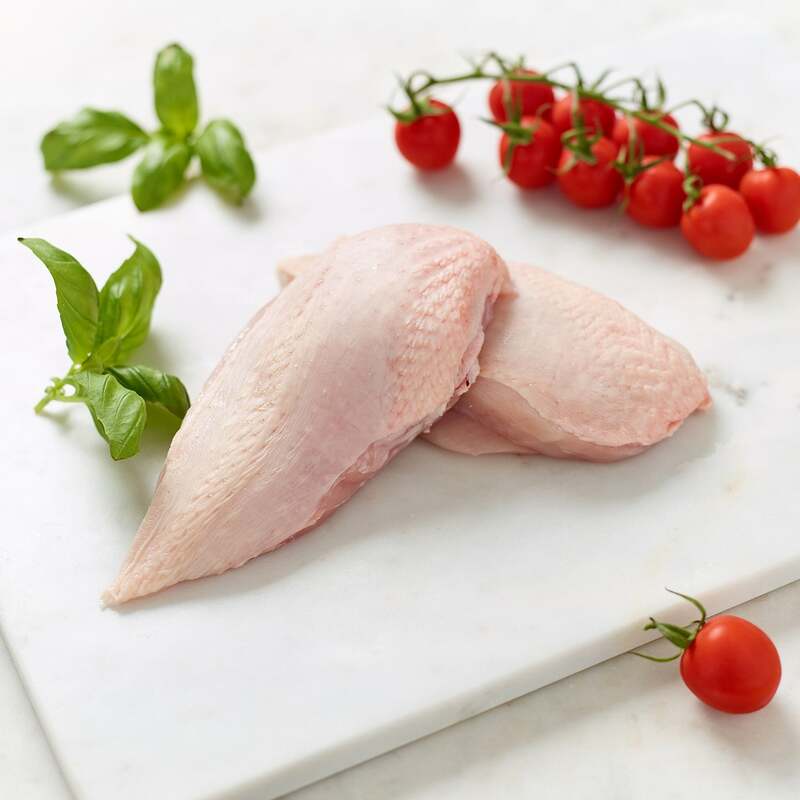 Our Chicken breast fillets are plump, full of flavour and not water. All our birds are slow growing strains, meaning they’re reared for a minimum of 10 weeks. During these 10 weeks are birds are well exercised, enjoy fresh air and fresh pastures. This slow growing method is what creates the lovely taste and texture for our high quality meat. We tray wrap all our chicken breast fillets, but if you require vacuum packaging just mention this in notes at checkout and we will do our best to ensure this is done. Our breast fillets come with approximately 2 per pack. The number supplied is a guideline. For those with a big appetite for Chicken you can bulk buy our chicken in multipacks. Purchase more than £59 worth of products and you also qualify for free delivery! Order by Wednesday morning, subject to availability, for same week delivery. Orders below £59.00 may incur an £8 to £15 charge. See delivery page for further details. All online orders sent out by Springfield are via overnight courier service. Due to the fresh and perishable nature of the goods, all orders are delivered before 12pm. For our reschedule or cancellation policy, please see our terms and conditions here. Springfield Poultry guarantees to only supply high quality, high welfare, fresh British free range organic poultry to our customers and consumers. We believe that the way you care for your meat makes a big difference in how they taste. Which is why we ensure all our Chickens and Turkeys are out in the fields from dawn until dusk. Grazing, exercising and enjoying the fresh air. Because our free range and organic birds are getting the best possible life, we can guarantee that the meat you receive will always be top quality and full of flavour. Sound good to you? You can read more about our guarantee here. Season the chicken to taste with salt and black pepper. Sear the chicken on each side to brown off the skin. Transfer the chicken to the oven for an additional 20 minutes at temp. Be careful not to exceed this time, as it may dry out the chicken breast. Once the chicken is cooked, allow the breast to rest for 15 minutes before eating to allow the juices to redistribute. This will really enhance the texture of the meat. Sign up for the Springfield newsletter to get recipes and discounts straight to your inbox PLUS a 10% discount on your first order when your create a website account! Please order by midday Wednesday for delivery by Friday. There is a small surcharge for non-mainland addresses. Delivery before 10am is also available for an extra charge. You are welcome to pick up from our farm on Tuesdays between 2pm and 4:30pm, or Wednesday to Friday between 9am and 4:30pm. There is no charge for collections.